When durable food service ware (e.g., plates, cups, utensils, etc.) is not feasible, disposable service ware is necessary. When this is the case, the most sustainable option is to use compostables. The U.S. Environmental Protection Agency reports that food waste is the single largest component of municipal solid waste that reaches landfills and incinerators. Switching to compostable, biobased food service ware presents a significant opportunity to advance sustainability in your facilities by enabling easier, more streamlined food waste composting. Using compostable food service ware makes it easy for a food service operation to divert its leftovers away from landfills into compost, because users don’t need to sort items into different bins. 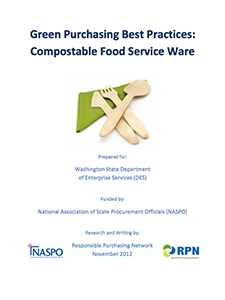 This report focuses on the use of fluorinated compounds in disposable food serviceware; offers recommendations and resources to help purchasers procure safer foodware products; and equips purchasers with tools to push manufacturers away from these harmful compounds and towards safer products. A key component of the report is the results of CEH's test on plates, bowls, clamshells, and multi-compartment food trays for their total fluorine content. In total, over 130 products representing 39 manufacturers/brands were tested. CEH's database lists foodware products by brand, product, material, type, environmental attributes, price, lab results, and more. This factsheet lists the types of food service ware products that typically do and do not contain PFAS and outlines available alternatives, including compostable options. On March 1, 2018, the Washington State Senate voted to ban the use of paper food packaging products containing the harmful class of nonstick chemicals called “PFASs.” The bill, ESHB 2658, was sponsored by Rep. Joan McBride (D-Redmond). The bill has already passed the House, and now goes to Governor Inslee for signature. 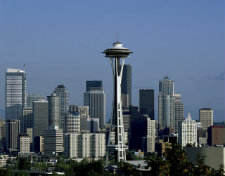 If the Governor signs the bill, Washington will be the first state in the nation to ban PFASs in food packaging. 5	Gyres Institute, Algalita, Californians	Against	Waste, Clean Production	Action,	Plastic	Pollution Coalition, Responsible Purchasing	Network, Seattle Public	Utilities, Story of	Stuff,	Surfrider Foundation and UPSTREAM joined together on the Plastics BAN (Better Alternatives Now)	List series of reports to identify the world’s most dangerous plastics. 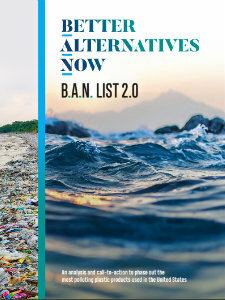 The	Plastics	BAN	List	2.0	includes data	from	across	the United	States,	focusing on	plastics	that	present	the	most	significant	chemical	hazards	in	manufacturing,	those	that	are the	most	dangerous when	absorbed	by	humans	and which	persist	longest	in	the	environment. Items	reported	as top	offenders	include	food	wrappers,	bottle	caps,	beverage	bottles,	bags,	straws,	and	lids,	made	primarily	from	polypropylene,	polyethylene,	and	polystyrene	plastics. Starting in 2019, BPI will require all products to be tested for total fluorine using widely available chromatographic tests. Additionally, they will adopt the European EN13432 compostability limit of 100 ppm as the upper threshold for acceptance. Shortly after, BPI will completely phase out fluorinated chemistry by requiring member companies to sign a statement that no fluorinated chemicals are intentionally added, in addition to limiting total fluorine to 100 ppm. Although reusable food service ware - also known as "durables" - is the best way to reduce food-related waste, their use is not always feasible. When this is the case, the most sustainable option is to use compostables. 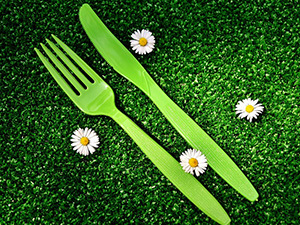 The guide outlines the benefits of buying compostable food service ware, available products, relevant green certifications and standards, model bid specifications, bid evaluation tips, and how to maximize your green impact. 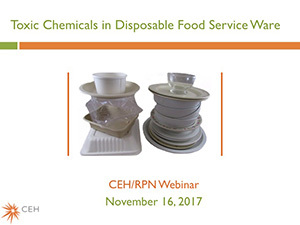 This webinar highlights new research confirming the presence of fluorinated, "non-stick" chemicals in a wide array of disposable plates, take-out containers, and food wraps. These toxic and persistent grease-resistant compounds can contaminate food, water, and compost. 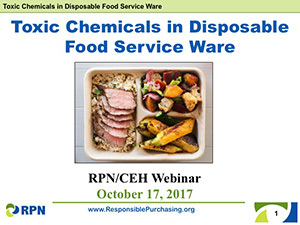 Presenters explain how to identify and procure food service ware products that are not only devoid of these chemicals of concern, but are also reusable, compostable, or easily recyclable. 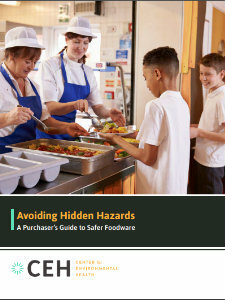 Policies, strategies, and resources to facilitate the purchase of safer food service ware products. 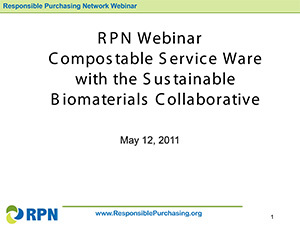 This comprehensive webinar is geared to both experienced "green" purchasers and those just getting started and covers important aspects of a successful food service ware program from an environmental purchasing perspective, and explains how to conduct product performance testing. It also provides detailed purchasing specifications, useful resources, and successful case studies. Compostable food service ware includes biobased bowls, cups, plates, clamshells, and cutlery. Successful case studies from public and private sector organizations.